...And who is this Serapion anyway? Why should we listen to him if he speaks? What does he want? "I don't need religion to make me a good person." Really? What do you consider a good person to be like? "Well, I've never killed anyone (yet! ), I don't steal." Hmm. You know King David did kill a guy, and he did it to hide the fact that he had slept with that guy's wife. Yet God says that David was a man after his own heart. Does avoiding doing something really bad make you good? Really? In the Orthodox calendar, today (10-April-2016) is the fourth Sunday of Lent and the day we remember St John Climacus, or as he is also known, St John of the Ladder. In the 7th century, John was a monk and eventually became an abbot (in charge of a monastery) because so many people came to him for spiritual help. Centuries before "The Purpose Driven Life", he wrote a book called "The Ladder of Divine Ascent" as a help to those who were seeking his advice. This book is still read around the world as a guide to becoming a "good" person. He pictures the spiritual life as if it were a ladder with 30 rungs on it. It is not an easy ladder to climb, and in fact one of the big problems is that there are evil forces at work to topple you and make you fall off. One of the keys to success however, is that if you fall, you just get right up again. The devils are primarily trying to make you give up, and this you must never do! The top of the ladder is union and communion with God, which is the real goal of our Christian life. Being "good" in itself is pointless. The purpose of our life is to know and love God. This is why Jesus came into our world, to open the way for us to have this communion with his Father. This is how we become men after God's own heart. Here is a list of the chapter headings in the book, just to give you an idea of what John is talking about. Whew! That is quite a list. Here is some stuff to chew on! Most of us don't even really understand what half of these things really mean. Yet in our hearts we know that John is on to something important. None of us in this life will ever perfectly achieve these things, and if we think we have, go back to the bottom of the ladder and start all over! But all of us can make a beginning and work on it. And in doing so, we become more like Christ himself and more intimate with His Father. And THAT is what it is all about. For an easy introduction to The Ladder, I found this book really helpful. Thirty Steps to Heaven: The Ladder of Divine Ascent for all walks of Life, by Vassilios Papavassiliou, 2013 Ancient Faith Press. My dear wife sent me a link to this article, which I here reproduce. I urge you to read it before proceeding. I thought this was a really good article and I commend the writer for studying at St Vladimir's Seminary, clearly outside his comfort zone, and exposing himself to a very different theological background. It takes guts to do that. I have been an "inquirer" into what we in the west call Eastern Orthodoxy for about the last three years and I also have come from a Calvinist perspective, but I reached different conclusions than the writer did. So I would like to offer a few thoughts on why. I strikes me that the author examines Orthodoxy's shortcomings from deep within his Western and Reformed tradition rather than looking at it on its own terms. While this is unfortunate, it is also not surprising. For me, looking at Orthodoxy has challenged my assumptions and my way of looking at the world. It is a different mindset. He remarks that the Orthodox do not seem to understand justification by faith. This cardinal doctrine of the Reformation is built on Anselm's theology (11th century), especially in his "Cur Deus Homo?" (Why did God become Man?). Anselm originated the idea that Christ's death on the cross was primarily intended to satisfy God's wrath against man for his sin and to thereby put us in a legally justified relationship with God. Note that this kind of justification does not empirically or ontologically change man. It is something that is not externally visible. The Roman church as a result, developed the idea of purgatory, realizing that justified sinners never the less needed to experience some sort of experiential growth in holiness prior to standing before a holy God in judgment. Luther of course, rejected this notion and declared that we are justified "by faith ALONE", an assertion, it should be noted, that the scriptures never make. What then often follows is a conflict between "faith" and "works", so much so that Luther was prepared to remove the Epistle of James from the New Testament canon. The Orthodox were not part of this Western theological debate and do not see salvation in this way. The Orthodox spiritual goal of "Theosis", or deification, is not quite the same as the Western notion of sanctification. Sin is seen primarily as a sickness that needs to be healed; Christ's passion provides the primary means of this healing, through His church. Theosis is nothing less than becoming progressively healed of this sin sickness and becoming progressively closer to God and in fact entering into the very life of God. For the Orthodox, this IS salvation. It is not an attempt to escape the fires of hell or the wrath of God, but rather to enter into the very life of God, who loves mankind and has demonstrated his love for us by his incarnation and passion (death, resurrection and ascension). The Western term "saving faith" presupposes the need to be saved in a judicial sense from God's wrath. This is not the salvation that the Orthodox are looking for, partly because they do not see God as essentially wrathful. The scriptures say rather that God is love, and the doctrine of the Trinity shows us that this is indeed the case: the Father has loved the Son from all eternity. In His Love, the Father sent his Son into the world to save sinners not from God's wrath, but from their own fallenness. Salvation is entering into this very love relationship with the Father. Nominalism is certainly a problem in much of American Orthodoxy. A recent census and statistical study for example, shows that the Greeks have the largest membership, but the lowest per capita giving and weekly church attendance. It is also true that most of the Orthodox churches in America have strong ethnic ties, which hinder them from relating to Americans that are not part of that ethnic group. These are all consequences of their history in this country. I see these two problems as intimately related. The primary reason why many immigrants to this country maintain ties to the church is not because of Christ but because of ethnicity. As the generations progress, these ethnic ties weaken. And so does their tie to the church. However there is a growing number of American-born converts to Orthodoxy and they are having an influence on this situation. As an example, the current head of the Orthodox Church of America (OCA, descended from the Russian church) is a non-Russian American who is a former Anglican. His predecesessor was also a convert from American Protestantism. The man who founded the OCA Diocese of the South was a convert from the Baptist church. Simultaneously as the generations progress, third and fourth generation immigrants must come to terms with living in America as Americans, and what this means for their faith. In any case, this is not a theological problem, but a practical one. It is a problem that is not unique to the Orthodox; there are many Protestant and Catholic churches with similar issues. And it is a problem that the Orthodox themselves are keenly aware of and seeking to address. The Orthodox certainly do not see grace, free will and "original sin" in the same way as Calvinists do. Calvinists believe that because of the fall of man, all men inherit guilt, and the image of God is damaged beyond recognition. Only with saving faith in Christ can this guilt be atoned for and the image of God restored in man. The Orthodox hold that Adam's sin did damage our likeness to God, but not His essential image in us. From the fall we inherit the propensity to sin, but not guilt, as if we are to blame for Adam's sin. This damage is the very thing that needs healing. In the natural, in order for us to be healed of a disease, we must get up and go to a doctor, and once there, heed his instructions. Just so we must choose to be healed of our sin by seeking and following the remedy that Christ has provided in his Church. In other words, we must choose to move toward God. Like the Prodigal Son, our motives may be mixed or even wrong as we move, but God, who like the father in that parable, is always looking expectingly for us, will more than meet us and give us His grace. Christ was not an imaginary person. If you had an iPhone, you could have snapped a picture of him and posted it on Facebook so people could "like" and comment on it. The incarnation really happened. Christ has made the invisible God visible. We are not alone. As Jesus said of Abraham, Isaac and Jacob, God is not the God of the dead but of the living. Those who preceeded us in faith are still very much part of God's family now, even though we cannot see them. In point of fact we are "surrounded by a cloud of witnesses", who are cheering us on and who are worshipping God right along with us. One aspect of this witness is the fact that these flesh and blood humans actually attained to a level of holy living and "theosis" - union with God - in this life. We need to learn from and be encouraged by their example. When reading Protestant statements of faith, one nearly universally finds that the first or perhaps second article describes the Bible as being the sole authority. As Luther put it, "sola scriptura", the Bible alone. However, scripture itself never claims this for itself. Keeping in mind that the New Testament canon was not agreed until well into the fourth century, what was the plight of the Christian people in a world where there was no complete Bible for the first three hundred years of the faith? For the Orthodox Church the criterion is not "is it Biblical? ", but rather "is it Apostolic?" In fact the decisions around which books would be in the New Testament and which would not centered around this criterion. The Bible is part, albeit the most important part, of the Apostolic tradition. The Bible is at its heart the Church's book and it can only be read within the context of the Church -- it does not and was not intended to stand on its own. All readers of the Bible bring with them their own tradition and interpret it through that tradition. The Orthodox assert that the only valid way of reading the Bible is through the Apostolic tradition, which is why they consciously seek to see how the church has interpreted it before. Looking at the Nicene Creed - the only creed to have explicit approval by the undivided Church and the one to which nearly all Christian groups adhere - we find that along with asserting belief in God the Father, the Son and the Holy Spirit there is belief, not in the Bible per se, but rather in the "One, Holy, Catholic and Apostolic Church". I appreciate his concluding statement "Let us have the maturity to keep the faith as we know it and to learn from others where we need to learn." I heartily agree. I have spent many years studying Protestant and especially Calvinist theology, as well as dealing on a practical level with Christians of many stripes. It was initially out of curiousity that I began to look into Orthodoxy. I continue to be fascinated by fact that the Orthodox see so many things in a completely different way than does Western Chrstianity. Even the very idea of "theology" is different. As a Calvinist, I was taught that right belief about doctrine was essential to saving faith. It was sufficient to assent to a body of propositional truths about God stated in a systematic theology. By contrast, the Orthodox do not call someone a theologian unless and until they have personally experienced the living God directly and have an ongoing relationship with Him that is evident in their daily living. When I examine the things I have longed for in my Christian life, I am surprised to find them in the Orthodox Church, hidden there all along, a "pearl of great price." And so I continue on this journey. We are formed by our life experiences and for me, my church experiences have been very formative. God has brought me (and later, me and my family) through a rich tapestry of his body the Church. I was "born" Roman Catholic, though my participation in that ancient institution has been minimal. I prayed to receive Christ in a small Bible church that had a faithful few that ran a great vacation Bible School one summer. I was confirmed in the United Methodist church. Ias a teenager I was puzzled that people came to church week after week, yet seemed no nearer to God then when they left. Yet, I learned to sing there as a way to worship God, and this has added richness to my life. One day while trying to find God I slipped into an old-fashioned pentecostal church that had rented out an old movie theatre. Complete with tongues and prophesy and being slain in the spirit. I stayed a while and learned a few things. Then I found that small Bible Church again which God had multiplied because of its faithfulness. I came to learn that they were Reformed and Baptist, oh and Charismatic. Then I became part of a Cell group-based church that was very international. Many of my friends went to a Charismatic Episcopal church, and others started to get into the writings of the early church fathers and the practices of the ancient religious orders. Then I moved and became part of a church that was essentially a "Name it and Claim it" faith church. I'm so sure God has a sense of humor! Yet he taught me many things here that I could not have learned anywhere else. I have learned that the circle God draws around his people is wider than we are usually willing to allow. I have learned that Christians can be the most naive and silly people, and yet God in his mercy, loves them anyway. I have learned that I am naive and silly, yet God loves me anyway. This is graduation season and we just held a hum-dinger of a graduation party for my high school graduate daughter. Great going, girl! It reminded me of what it will be like when we get to Heaven. Let us rejoice and be glad, the scriptures tell us. For we will have come through great tribulation to stand before his throne and to celebrate with him in that great party God will throw -- the wedding feast of the Lamb of God. We will have made it through! What does it say about....? pick your topic. I want to challenge you that many of the things you think of as the way things should be within the church or among Christians simply have no basis in the Bible. Many do not even have a long history within the church. If we are serious about reaching the people of OUR world in THIS century, we must be radical. We have to go back to the root -- what God says in his Word. And you must be prepared to face the fact that what he says in his word may not be what you expected. So much of the way we do things as American Christians is dictated not by God, but by culture. That does not in itself mean it is wrong. It may be "indifferent" (that means, it doesn't matter). But perhaps this way needs to be changed in order to make us effective in what God has us here to do. ....Or why angels may not be the best decorative accent. The first time we see angels in the Bible is in Genesis 3. 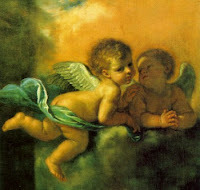 Were they hovering around lovingly watchin over their little lambs Adam and Eve? NO! They were brandishing swords to make sure Adam didn't sneak back into Eden! How cute! Next we see an angel visiting Abraham. Abraham obviously regards him with respect and immediately offers him hospitality. The angel calls down fire from heaven and consumes the meal Abraham provided and converts it into a crispy critter. How cute! Fast forward to the end of the book - Revelation. Angels are all over the place. They are soldiers in the army of God, they wield scythes to harvest the people of the earth, they set the tone of heaven by calling to one another "Holy, Holy, Holy!". I don't know about you but I just don't see cute here. Gentle Jesus Meek and Mild. This picture and others like it grace the walls of many a Sunday School in our land. 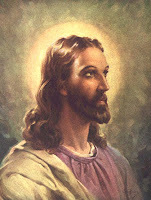 Was Jesus a bearded lady? This is a typical image of Jesus from a Byzantine church ceiling. Here it is clear that Jesus is anything but meek and mild. He is the ruler of the universe and is sitting upon the throne of heaven. Nothing escapes his notice. Nothing catches him with his pants down. He created the universe from the smallest quark to the largest galaxy complex in seven days and he didn't even break a sweat when he did it! Oh, and that guy kneeling and kissing his feet - that would be one of the kings of the earth. One day Tony Blair and George Bush will kneel before him along with King Faisal, Indira Ghandi, Ayatollah Khomeini and every other ruler you can think of, and will kiss His feet. Young men long for role models. Who are the good Christian role models that we can look up to and admire? Men don't really admire other men who are "nice", or "tolerant", or "easy-going". We admire men who are tough but fair. Smart but not pompous or a smart-aleck. Strong but not tyrannical - who know how to use their strength for doing what is right. Here is a fine Presbyterian Christian man. He was a fine role model for children to look up to. I personally admire him for presenting a positive world to children, and in many ways he was a man of conviction and a trail-blazer. However I suppose he is not quite what most adult men are looking for. Curiously he did come across in a manner similar to some pastors. Perhaps we could look to someone like Mother Theresa. She was a magnificent Christian woman. Oops, that would make it hard for her to be a role model for men, wouldn't it? Seriously William Wilberforce would be an excellent candidate. Unformtunately the recent movie about his life does not do him justice. He led a Christian group called the Clapham Sect in England in the early 1800's and campaigned tirelessly for the abolition of the evil slave trade that aided in placing thousands of black slaves on American soil. He worked for 20 years of his life as a member of the British Parliament to accomplish his goal. Happily he succeeded, just days before he breathed his last. God honored and respected Adam as a man. He gave Adam his first project, naming the animals. God also gave him his first job, tending the garden. Then he gave Adam his wife. God made sure to spend time fathering Adam by meeting with him in the cool of the day. it was something The Father clearly looked forward to. 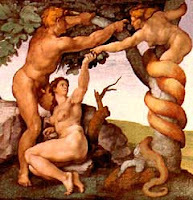 But one day while Adam and Eve were spending time together, Eve heard the voice of the serpent. The scripture says that Eve gave some of the fruit to her husband who was with her! In other words, Adam heard the conversation between his wife and the evil one. Eve was deceived, but Adam knew better. But he chose to be passive and do nothing. Worse - he ultimately decided to choose his wife over his Father (who gave him the wife). Ah, men, brothers, how like our father Adam we are! We feign passivity instead of bringing our considerable strength to bear. We falsely think we have no strength. And we choose the Beauty that God gave us thinking that in her, bone of our bones, flesh of our flesh, we will finally find our completion and fulfillment. We make that lovely person into an idol -- and one destined to disappoint because she is not able to be our God. Still God honored the man as a man by holding him responsible, he who tried to avoid responsibility to the end -- "it was the woman You gave me!" But there were real consequences for his actions. This was not a game. Now we're playing for real. In 1922 a group of young writers inspired by the work of Yevgeni Zamyatin, founded the Serapion Brothers. The group took their name from the story by E. T. Hoffmann, the Serapion Brothers, about an individualist who vows to devote himself to a free, imaginative and non-conformist art. Members included Nickolai Tikhonov, Mikhail Slonimski, Mikhail Zoshchenko, Victor Shklovsky, Vsevolod Ivanov and Konstantin Fedin. Russia's most important writer of the period, Maxim Gorky, also sympathized with the group's views. Serapion was Patriarch of Antioch (191 - 211). He is known primarily through his theological writings. Eusebius refers to three works of Serapion in his history, but admits that others probably existed: first is a private letter addressed to Caricus and Pontius against Montanism, from which Eusebius quotes an extract (Historia ecclesiastica V, 19), as well as ascriptions showing that it was circulated amongst bishops in Asia and Thrace; next is a work addressed to a certain Domninus, who in time of persecution abandoned Christianity for the error of "Jewish will-worship" (Hist. Eccles, VI, 12). He was the largest Serapion in Antioch. "We, brethren, receive Peter and the other Apostles even as Christ; but the writings that go falsely by their names we, in our experience, reject, knowing that such things as these we never received. When I was with you I supposed you all to be attached to the right faith; and so without going through the gospel put forward under Peter's name, I said, `If this is all that makes your petty quarrel, why then let it be read.' But now that I have learned from information given me that their mind was lurking in some hole of heresy, I will make a point of coming to you again: so, brethren, expect me speedily. Knowing then, brethren, of what kind of heresy was Marcion... From others who used this very gospel— I mean from the successors of those who started it, whom we call Docetae, for most of its ideas are of their school— from them, I say, I borrowed it, and was able to go through it, and to find that most of it belonged to the right teaching of the Saviour, but some things were additions." Eusebius also alludes to a number of personal letters Serapion wrote to Pontius, Caricus, and others about this Gospel of Peter. Serapion also acted against the influence of Gnosticism in Osroene by consecrating Palut as bishop of Edessa, where Palut addressed the increasingly Gnostic tendencies that the churchman Bardesanes was introducing to its Christian community.